October 10, 2008 · BY Dr. Andrew Coggan, Ph.D. It is simply human nature to wonder how one compares with others for any measurement, and cycling power output is certainly no exception to this rule. Consequently, there have been numerous calls for, and some attempts at, generating guidelines or benchmarks for power output based on rider category (i.e., cat. 1, cat. 2, etc.). Aside from satisfying people’s natural curiosity, though, such category-based values would seem to have limited practical use – after all, the best measure of a rider’s competitive ability relative to that of others is their actual race performance, not their power output. If, however, valid standards were available for power across different durations that represented different physiological characteristics or abilities, then it would be possible to identify a particular individual’s relative strengths and weaknesses based on their “power profile”. In such an analysis, the primary comparison would therefore be the rider against themselves, and not (directly) against others. Such information could be then used to help plan an individualized training program, evaluate the effectiveness thereof, and to possibly identify events where an individual might be expected to achieve the greatest success. My goal was therefore to develop rationale guidelines that could be used for this purpose. 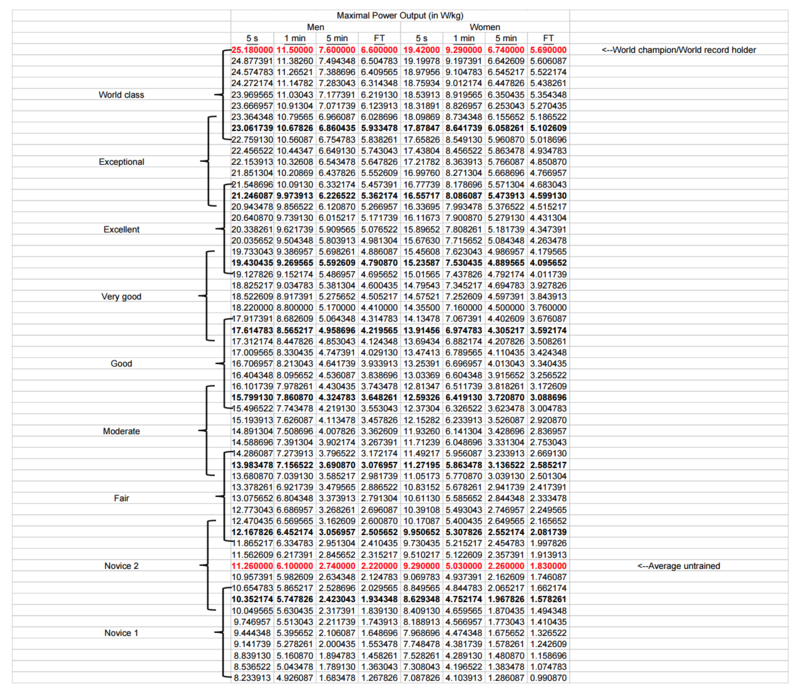 In theory, tables of standards for power output for different durations could be generated by simply collecting data on a large number of cyclists of widely varying ability. However, it is highly unlikely that any coaches or other individuals would have access to a sufficiently large database for this approach to be very accurate. As an alternative, estimates of power output for riders of differing abilities could be derived from actual performance, e.g., in time trials – this approach, however, requires making somewhat tenuous assumptions regarding body mass, CdA, etc., and is particularly complex when applied to shorter duration, non-steady-state events (e.g., kilometer). I therefore used a third approach, which was to “anchor” the upper and lower ends of each range based on the known performance abilities of world champion athletes and untrained persons, respectively. The advantage of this approach is that it enhances the validity of comparisons across event durations, e.g., a “world class” power output should be equivalent regardless of whether the duration over which it is measured is 5 s or 1 h. The resultant values for intermediate performances were then cross-checked against available data to assure that this approach resulted in valid guidelines. Index efforts of 5 s, 1 min, 5 min, and at functional threshold power were chosen as those best reflecting neuromuscular power, anaerobic capacity, maximal oxygen uptake (VO2max), and lactate threshold (LT), respectively. This should NOT be taken to imply that, e.g., a 1 min all-out effort is completely anaerobic (in fact, roughly 40-45% of the energy during such exercise is derived aerobically) or fully utilizes anaerobic capacity (which generally requires 1.5-2.5 min to deplete), or, e.g., that a 5 min all-out effort entails exercising at precisely 100% of VO2max (most athletes can sustain a power that would elicit 105-110% of their VO2max for this duration). Rather, power output over these target durations would simply be expected to correlate well with more direct measurements of these different physiological abilities. Secondarily, the index efforts were chosen in an attempt to increase reproducibility (e.g., use of 5 s vs. 1 s power as an indicator of neuromuscular power), and for convenience. (-) Generally horizontal plot, i.e., all four values falling at about the same point on their respective range (-): this pattern is characteristic of the typical “all rounder”, i.e., a rider who doesn’t necessarily excel at any one thing, but is likely competitive in their category across a broad range of events. Given the fact that only specialists will likely truly excel at the extreme durations, very few individuals will show this pattern and still fall at the upper end of each range. On the other hand, the vast majority of non-elite athletes will likely show a generally horizontal power profile. () Distinctly down-sloping plot (esp. between 1 min and 5 min): this pattern would be characteristic of an excellent sprinter/”fast twitcher”, i.e., an athlete whose naturally abilities are skewed towards success in short duration, high power events. Since aerobic ability is quite trainable, such an individual may be able to turn themselves into more of an “all-rounder” by appropriately-focused training – however, if they have already been training hard for many years, they may always still be better at anaerobic vs. aerobic efforts. If so, focusing on events that favor these abilities (e.g., track racing, criteriums) may result in the most success. (/) Distinctly upsloping plot (again, esp. between 1 min and 5 min, but also somewhat between 5 min and functional threshold power): the classical time-trialist pattern, i.e., weak in neuromuscular power and anaerobic capacity, but with a relatively high aerobic power and especially a high lactate threshold. While such athletes may improve their performance by working on their weaknesses, this may not necessarily be true if it results in a decline in their strength, which is sustainable power. (^) Sharply inverted-V pattern: an athlete characterized by both relatively high anaerobic capacity and aerobic ability, and thus well-suited for events such as the pursuit. Alternatively, a potential “all-rounder” who simply hasn’t focused on raising their lactate threshold to its highest possible level. (V) Sharp V-pattern: an unlikely combination, given the expected inverse relationship between neuromuscular power and lactate threshold, and the positive relationship expected between VO2max and lactate threshold. Should such a pattern be observed, care should be taken to assure that the values being used are truly representative of the athlete’s abilities, and to be sure that the pattern isn’t simply being misinterpreted (i.e., considering a generally horizontal or “w” pattern to be a “V”). The standards are based on the performance capacities of young adults, and thus do not account for the effects of aging (or development). The possibility of developing age-specific standards was considered but rejected due to the lack of sufficient direct data as well as the complexity of attempting any corrections based on known physiological changes. For example, while VO2max declines by ~0.5 mL per min per kg per year (~0.35 mL per min per kg per year in women) starting at around age 30, muscle strength and power are generally well-maintained until around age 50, then begin to decline somewhat more rapidly thereafter. 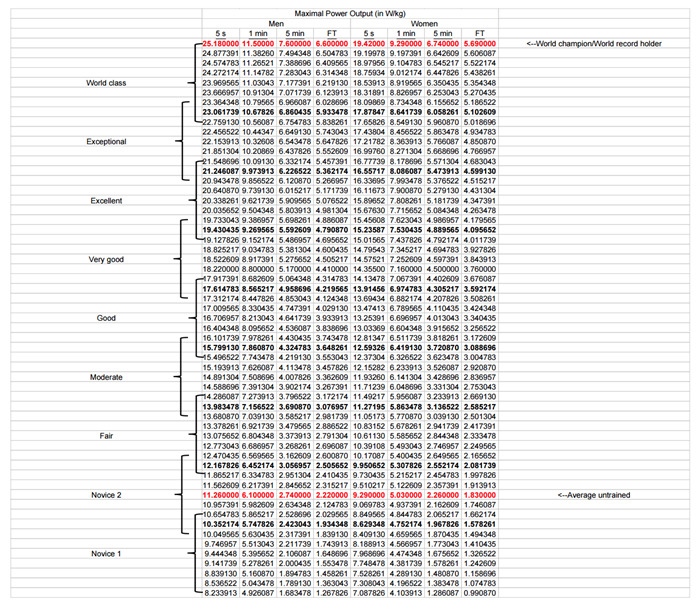 Such observations imply that, for maximum accuracy, different age-based correction factors might need to be applied to the different columns. It is unlikely, however, that these differential changes with age are sufficient to significantly alter a rider’s “profile”, and it is suggested that the tables simply be applied “as is” regardless of a rider’s age. I would like to thank Hunter Allen, Joey D’Antoni, Jeff Labauve, Jim Martin, John Verheul, and Dave Martin for providing data and feedback during this project. 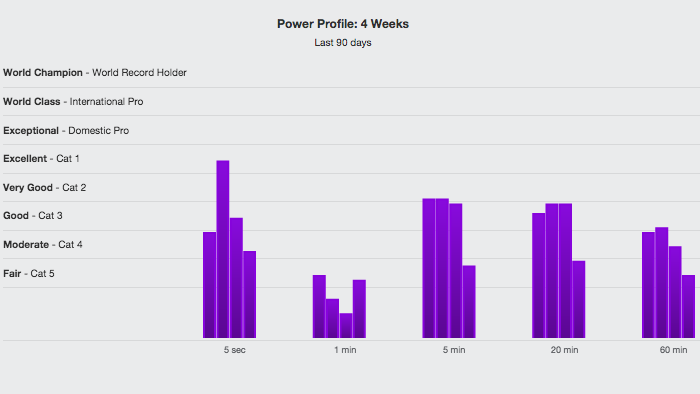 Did you know that you can now view the Power Profile Chart on the web using TrainingPeaks Athlete Edition Software? Or, use the Power Profile Chart within WKO4 desktop software. About Dr. Andrew Coggan, Ph.D.
Andrew R. Coggan, Ph.D., is an internationally recognized exercise physiologist. He has published numerous scientific articles on the physiological responses and adaptations to acute and chronic exercise in healthy untrained individuals, athletes, the elderly, and various patient populations. A former national-caliber masters cyclist and TT record holder, Dr. Coggan is also widely recognized as one of the leading experts on the use of power meters. He is the originator of numerous concepts/algorithms for analyzing the data that such devices provide, including normalized power, TSS, power profiling, quadrant analysis, the Performance Manager, the WKO4 power-duration model, auto-phenotyping, and unique pedaling metrics. In 2006, he was honored for these applied sports science efforts with USA Cycling's Sport Science Award and by being named as one of three Finalists for the US Olympic Committee's Doc Councilman Award.